Just a quick heads up to folks headed out of town for the holidays this week, caimito or star apples seem to be at the peak of the season in the Southern Tagalog provinces, and are abundant at roadside fruit vendors. I did a post on caimito several years ago, here, and please refer to that entry for the scientific names and other bits of trivia. I have never been fond of this fruit, I find the texture and consistency to possess a really odd mouth-feel. Frankly, I get icked out by it. But Mrs. MM is a huge fan of caimito (odd, considering she didn’t eat much fruit before we married) and likes a just ripe fruit to be straight out of a refrigerator and the flesh scooped out with a spoon from each half of a sliced fruit. Haven’t seen and tasted “kaimito” for ages. But I do remember enjoying them when I was in grade school. BTW, isn’t this fruit the same as star apple? I love this fruit.We used to get heaps where my mom used to teach.They have star apple trees there.And every summer we go swimming in the pool then my brother and i roam around after while waiting for my mom to finish summer work.Around end of April is like peak season…You can see them literally fall down from tree coz theyre ripe already.Yummmmm!Just watch out for the little worms tho hehe. Brings back memories.I havent eaten star apple for more than 10 years now.I dont think we have here it in New Zealand. i love kaimito, i don’t even need it chilled.guyabano sorbet is also a favorite summer treat.i don’t know about durian, i never had it fresh and i don’t think frozen ones give it justice.i also miss atis.i haven’t had one for 18 years now. This fruit brings about nostalgia from my childhood summers spent at my nanay’s(lola)…she used to have a tree in her backyard and we used long sticks with nets to pick the fruit since I remember this tree to be really tall. I only like this very well chilled. Haven’t eaten this in ages. with regards to the other fruits like guyabano and durian,love them is shakes. They’re also great when eaten chilled. I love star-apples too! There are heaps of it just now here in Divisoria. It has to be cold to be really enjoyable. Camilia is right in saying that there are worms sometimes. I have never had kaimito and will have to inquire about them at the local supermarket. I am always looking to introduce my daughter to new fruit. Hopefully I will be able to find them. I had about 25 pieces of star apple sent to me last week. I chill it and eat 5 to 6 at a time. It was finished in 2 days! I like this fruit when it is really sweet. As it kept longer though and becomes soft, there is a bitterness to the taste which I don’t like. This comes second to my favorite fruit, Mangosteen! my family loves these and we buy them by the basketfuls. i prefer these sliced in wedges and chilled, but hubby loves them scooped into tubs, mixed with milk and a little sugar or condensed milk, then chilled or frozen. when slightly frozen, (not rock-hard), it turns into a very good sherbet. I like kaimito, durian and aratilis, guyabano, carabao mangoes, and many more of our very own fruits! Summer’s great despite the usual heat. My lola had a big tree at the back of her house and it’s this same variety. (There are green ones). What I use to do is scoop the flesh out and add condensed milk. Sometimes we buy ice and chill them too. Delicious! We had a tree in our backyard once and i didn’t like it so much then because of it’s sticky sap but i would love to have some now. It’s been years since i’ve tasted one. We had a star apple tree in our front yard when I was a kid and it was the target of the other kids in the neighborhood during summer with their makeshift “sungkit” and it drove our dog crazy. Like Millet’s husband, we scooped out the flesh, took out the seeds, would mix this up with evaporated milk, water and sugar and put them in ice cubes in the freezer. It was my Lola’s way of making us eat fruits instead of buying junk food and what she called frozen colored water (ice candy). After years and years of giving us fruits, that tree was felled by a typhoon. love this fruit! plain chilled or with condensed milk. as for guyabano, i love it chilled with a little sprinkling of salt or as shakes. i can eat as much of it til my stomach aches! haha… durian on the otherhand… i eat just a chilled piece and then no more. 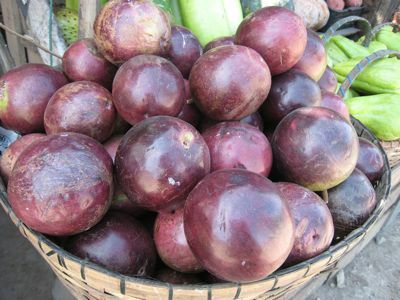 During heady summers in my uncle’s house in Cebu, we would pick ripe kaimito off the trees in the yard. Slice the fruit in half, scoop out and mash the flesh, discard the pits, mix in condensed milk, then chill in fridge before enjoying with gusto. It’s my favorite memory of Cebu. I love kaimito! Your post on this is so timely as I have just requested my MIL to bring me some when they come to visit us during the holy week. Can’t wait to get my hands on them! my number 1 fave fruit! a friend bought huge ones from the Salcedo market and when they got to me they were perfectly ripe and sweet. Yum!!!!! This fruit reminds me of my boyhood when we use to climb up the tree to harvest them!!! Had them about a week ago here in Cebu. And yes, it taste great chilled…..hmmmm Caimito ice-cream or Sorbet…think it will work, MM? I love the sweet purple colored caimito best!I bought a few kilos from the supermarket a few days ago and I was disappointed they weren’t that sweet.Next time I’ll buy from the market and road stalls.But the sineguelas and duhat I bought together with the caimito were sweet!These are the fruits that reminds me of childhood.Guyabano too and balimbing!I wonder what fruits children of today will remember when they grow old?Apples?Grapes?Oranges? I didn’t know they were called caimitos. We ate loads of star apples in Zamboanga and Basilan. 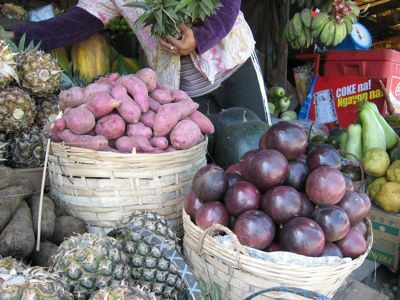 These are the stuff that made a happy childhood – the mangoes, star apples, rambutans, siniguelas, durians, lanzones, the chesas, atis. I know, I can’t remember the others – that’s why I depend on Marketman to bring out all those memories. Thank you. This used to be a favorite but I was unfortunate to come across one with a maggot. It’s a good thing I haven’t taken a bite. I can eat a dozen of these in one sitting! I missed star apples. My aunt in the Phil. used to bring us a huge basket filled with this fruit from their backyard. I love star apple! CHildhood treat and eating it as an adult brings back wonderful, carefree childhood memories. I prefer the greenish brown ones over the purple ones as the latter are fibrous. Best eaten plain and chilled. Recently bought some from Batangas at 30 pesos a kilo. My mom planted a kaimito tree in front of her childhood home and it still yields fruit till now. I love it de-seeded and frozen so when it comes out, it’s like sorbet. I have also experimented on these fruits by adding milk and young buko (not a good idea), using as topping for vanilla pudding (if pudding is a tad bland, it works) and cooking in hot pan for a while with some muscovado and a splash of white wine then used as crepe filling (best with durian or plain vanilla ice cream). Try it, it might change your mind. My grandparents used to have it in their backyard but the green ones. I like it and it’s been years since I ate some. We are always thought to eat in moderation as it can make you constipated. I like guyabano but not fresh durian although I like Durian Yema. ooops…I meant “reminded” not thought. Green caimitos for me MM. somehow the red ones just freak me out. love star apple. haven’t had it for so long but remember eating lots of it growing up. have to eat it ripe or it can be mapaklat..tama ba yon? I grew up in Caloocan where the back of our family compound was named Caimito Street. I guess it was called that because the whole street was lined with Caimito trees. We probably had at least 6 big trees in our backyard and I climbed these in the summer. Come February, my mouth would be constantly lined with the sticky sap from eating ripe sweet caimitos all day long. My lola would tell us to eat a lot of caimito when we had diarrhea. Haha! Seeing caimitos by the roadside never fails to remind me of childhood summers. We had a mighty tree that bore purple ones in the front yard and in the backyard were younger trees that bore green fruit. Liked the purple ones better; they’re somehow sweeter. Like the others have already posted, we would pick the fruits by sungkit and turn some into “caimito ice cream” then the rest of it–several pails and batya full of the fruit, us kids would sell for P1 each. Those were the days. Now the purple tree is gone–felled by a typhoon. But the caimito blanco now bears fruit. LOVE this fruit. But now I can only get them at a really ridiculous price and only frozen at the Filipino store. Ok na rin. isa sa mga paborito kong prutas. sarap sarap! Scoop the ripe caimito flesh and make it a fruit shake. Very refreshing. I prefer the murado (purple) than the green caimito. Cafe Bola has a wonderful caimito shake (seasonal). Super yummy!!! A favorite fruit of mine especially when I was a boy in Dagupan. After classes I would climb up our backyard caimito tree and pick ripe ones to eat right up there. They were so sweet, the green ones. My favorite merienda. One day I read a recipe of a caimito dessert that we tried in our family. It is kind of vague now what the exact ingredients were. However it involved the caimito flesh scooped out mixed with milk, am not sure if it was evap or condensada, and ground fried peanuts…you know those that you can buy in the market fried with their thin skin on and with garlic. We chilled this mixture and ate them after meals. It has been a while since I had caimito! I love star apples.. chilled or frozen. Just back from sydney and ate at a restaurant called Rockpool. Theyhad star apple mascarpone cheesecake on the menu, I wanted to try it but my husband could not be convinced. Gggrr! I love this fruit very much. If you have tasted the best, well, you need nothing but the fruit itself. It’s very juicy and very sweet and with very nice smell and no gummy thing. 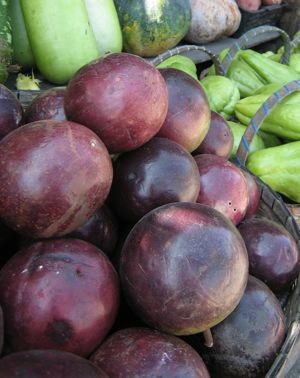 My real experience with this fruit was, it comes in a variety of sizes, shapes, colors, and textures. The giant round green is the best, second is the giant oval. I have no idea if you can eat two of these fruits. They’re really big. So many good things to remember on fruity summer. I love the Star Apple. When I was in the Navy stationed in the PI, I had a tree growing just a few yards from my front door. It was the round green variety. I would sit in a chair on my porch and wait for a breeze to loosen a fruit. As soon as I saw the fruit falling, I would jump out of my chair and position myself so that I could catch it before it hit the ground. The reward was the most wonderful and sweetest fruit I have ever tasted. I tried growing a tree here but didn’t have much luck. Man do I miss them.